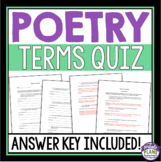 POETRY TERMS QUIZ - METAPHOR, SIMILE, HYPERBOLE, PERSONIFICATION, & MORE! 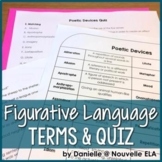 Quiz your students over poetry terms and figurative language terms. There is also a figurative language representation section. **Check out my other worksheets! This is a quiz over poetical terms. This can be used alone or with my Robert Frost poetry unit. The quiz has 22 matching and several identification questions. Three poems are listed and students are asked to find examples of alliteration, onomatopoeia, metaphor, etc. Students will master matching the common poetry terms to its appropriate definition. Students will also be assessed on providing an example of the following: Simile, Metaphor, Imagery, and Sensory Language. The 15 basic poetic devices - alliteration, rhyme scheme, onomatopoeia, metaphor, simile, stanza, internal rhyme, etc. and their definitions are assessed in this multiple choice quiz. Key included. Basic poetry terms matching quiz. Helpful for introducing poetry to students. 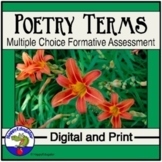 Best used with corresponding poetry terms and definitions worksheet. 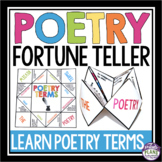 14 basic poetry terms are assessed in a matching format. Terms such as alliteration, metaphor, rhyme scheme, rhythm, onomatopoeia, etc. are used in the quiz. Key included. This quiz consists of song lyrics taken from popular music. There are three matching sections with five lyrics per section. There is another quiz of this type along with a test on two other listings. 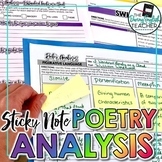 A 15-question matching quiz that contains many of the poetry terms found on middle-school and standardized tests around the country. Terms include idiom, simile, metaphor and hyperbole, among others. A brief quiz with definitions and a word bank of popular poetry terms like imagery, simile, personification, rhyme scheme, narrative and lyric poetry and meter. 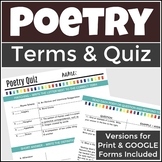 A quiz on basic poetry terms. Matching quiz - 20 terms, 20 definitions. Can also be used as homework or classwork. Poetry terms for students to study and a quiz to assess. A quiz on various poetic terms and locating them within a classic poem by Wordsworth.